The El Capitan Theatre in Hollywood, CA is easily one of my favorite theaters to watch classic and newly released Disney movies. Now, they’ve added a new ticket option following in the footsteps of other premium theaters nowadays. 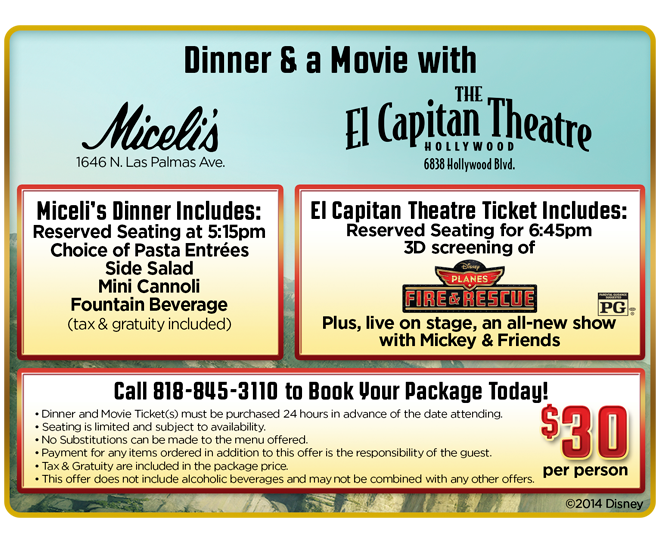 This summer, El Capitan is taking guests’ experiences up a notch with its new “Dinner and a Movie” option in partnership with Hollywood’s classic Miceli’s Italian Restaurant for $30 per person. Sounds a bit pricey? Don’t worry. That was also my initial thought. But considering that dinner, a movie ticket, tax, and gratuity are included makes this option a steal! 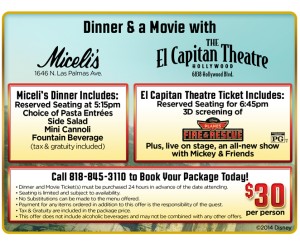 The special package includes 5:15 p.m. reservation at Miceli’s just steps away from the El Capitan. The dinner includes your choice of pasta entreés, side salad, fountain beverage, and a mini cannoli for dessert! Dinner is followed by reserved seating for the 6:45 p.m. 3D screening of “Planes: Fire & Rescue” at the historic, Disney-owned El Capitan. If you haven’t seen the movie, make sure to check out our spoiler-free review HERE. 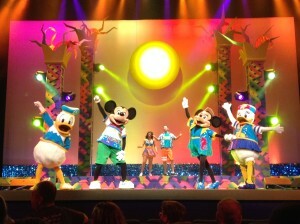 We had the opportunity to try the experience and it sure is a family friendly event that’s great for all ages! The reserved seating and quick service during dinner was a definite plus, but keep in mind the limited food selection was between spaghetti and ravioli. Nevertheless, dinner was just enough to last me through the movie without feeling uncomfortably full. Once we finished our dinner, we made our way to the theater which was within walking distance just 2 blocks away. Be sure to grab your seat on time before the movie because you won’t want to miss out on the pre-show featuring a classic short, “Mickey’s Fire Brigade” plus a live on-stage performance with Mickey and Friends. The new Dinner & a Movie package is looking to become a more permanent option for future movie screening at the El Capitan, but for now is just a limited time offering, so be sure to experience it while you still can! Is “Dinner and a Movie” going to be on your summer list? Will you be bringing your family or friends to take on the new experience? Have you ever watched a movie at the El Capitan Theatre? If so, which movie? Let us know in the comments below!